As we drift closer to spring, I find myself looking more forward to wildflower season with each passing day. The hope for a colorful crop of flowers this year is alive, especially with the winter rains we’ve had here in central Texas. Our property is once again showing large amounts of bluebonnet rosettes hugging the damp ground. With that said, I have to temper my expectations. Just last year, we’d had copious amounts of rain, were in the middle of an El Nino, and the future looked colorful. And then we went 60 days without a drop of rain. The bluebonnet season was basically a bust, and even the usual wildflowers such as bluebonnets, bitterweed, Indian blankets (firewheels), poppies, and others never realized their full potential. I am looking forward to an early Spring trip to Big Bend where the Big Bend Bluebonnets bloom much earlier than their Hill Country cousins. Flowers or not, that is always one of my favorite places to explore and photograph. So we wait, hope for rain and colder weather until March and April. 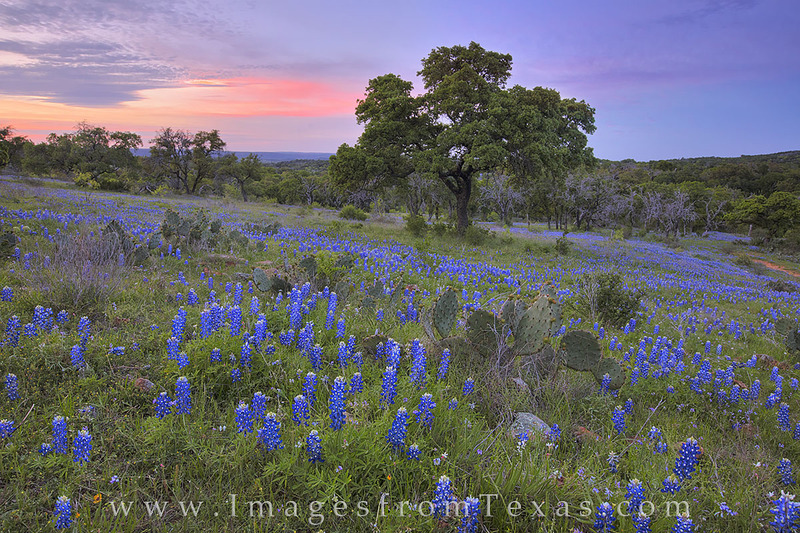 This bluebonnet photograph was the last image taken on this quiet evening in the Hill Country. This favorite Texas wildflower was scattered across the rolling hills, and the sky showed a bit of color as day transitioned to night. If I had not sat on a cactus while trying to get low to shoot from ground level, this would have been a perfect evening! I’ll update this blog as we draw closer to Spring and nature’s return to life! Posted in Bluebonnets, Texas Hill Country, Texas Landscape Images, Texas Wildflowers and tagged bluebonnet photos, bluebonnet report, bluebonnets, texas bluebonnets, texas wildflower photos, texas wildflower report, Texas wildflowers on January 25, 2017 by Rob Greebon.